NBA general managers have a lot of respect for Jarrett Jack's intelligence. 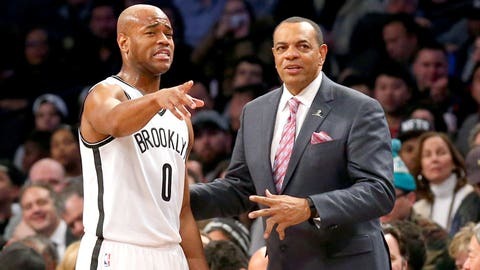 The Nets didn't fair particularly well in the NBA's annual survey of GMs predicting and evaluating information and events for the upcoming season. Actually, Brooklyn only placed in one category: Which active player will make the best coach someday. Jack is far from being known as the headiest player in the NBA, but sometimes, a player's on-court demeanor doesn't always transfer to his thoughts on the sideline. If you get Jack talking off the court, he's one of the more cerebral and intelligent players in the league, both in topics involving and not involving basketball. But once you get him talking hoops, he can blow your mind with X's and O's or general knowledge. It's not a surprise to those who know Jack that he made this list, only to the ones who purely get their sense for his basketball IQ from the way he plays, not the way he knows he should play.